New season. Lacking in some detail for this race. 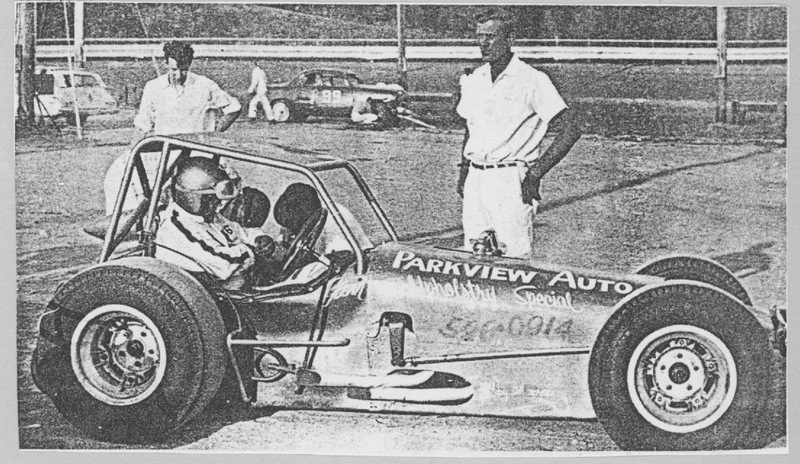 Ken Horner flipped four times in practice before time trials. Taken from the H.A.M.B. forum's Oregon thread. 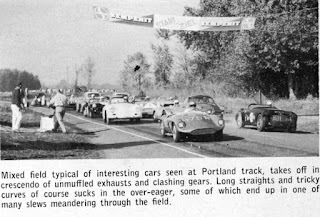 An old story on what is now Portland International Raceway. 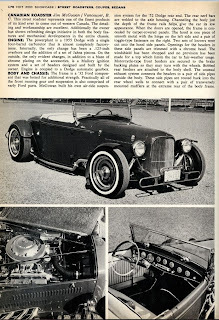 Done by Pete Sukalac, who contributed to Hot Rod magazine amongst other magazines of that era. Nice to see a picture of Pete Kellond racing down there. 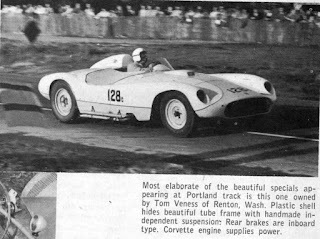 Other names are also familiar like Harry Eyerly and Tom Veness. 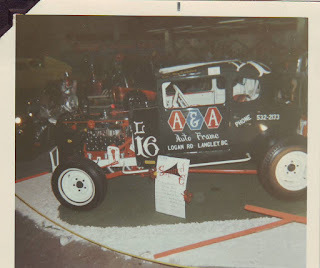 Thanks to Golden Wheels' Dave Craver for the photo. 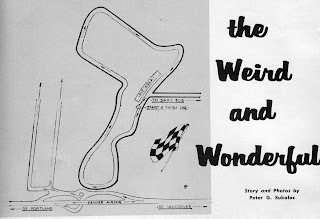 While I doubt it was the full circuit, the sprint cars of the Pacific northwest did race at Kent, WA's Pacific Raceways in 1960. There was some controversy as the race was held the same day as the Sea-Fair sports car races at Shelton. I've only had rumours of this race, having got a photo sent to me about five years ago. 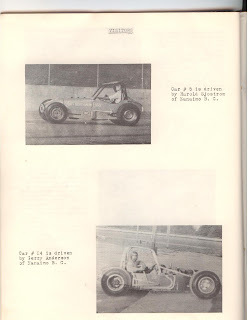 And then recently a column in a 1976 Racing Wheels had a report on the race. So it sometimes takes time to piece a small bit of history together. 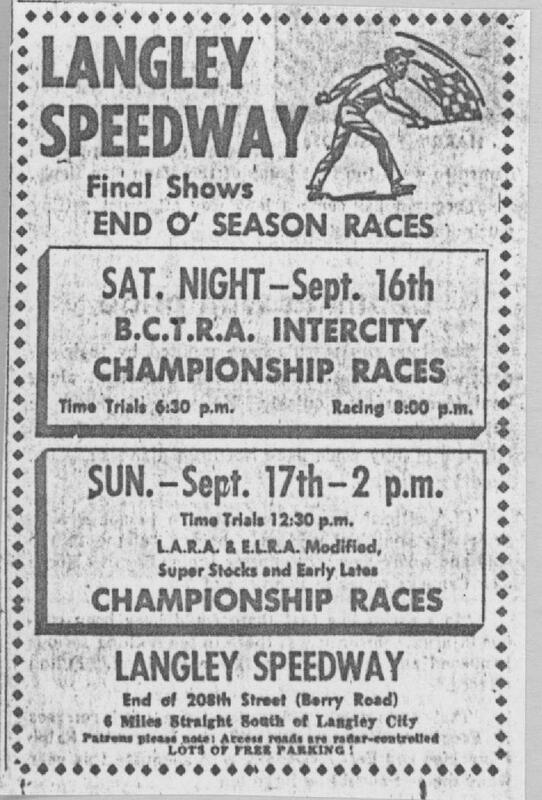 The three track circuit -- Langley, Western (Victoria) and Grandview Bowl (Nanaimo) -- ended up with the A and B modified points looking like this. Lots of trophies handed out by the BCTRA, LARA and ELRA at their respective season ending banquets. 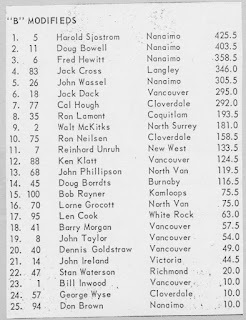 Jim McMillan inside of BCTRA points champ Bob Keam. 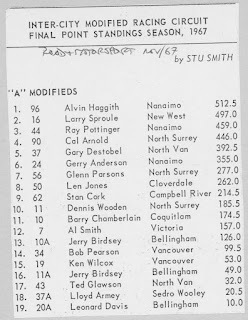 Glen Parsons, third in BCTRA A modified points. 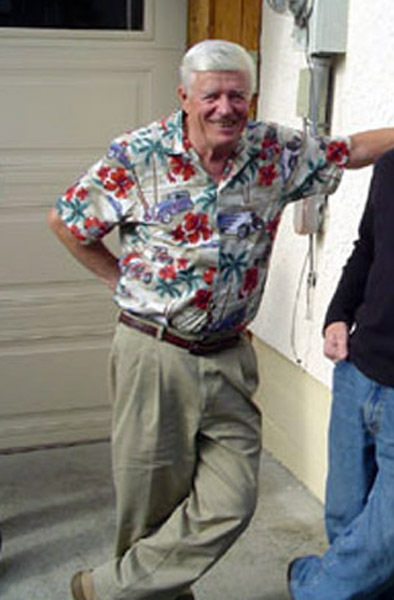 Norm Ellefson, winner of the July CAMRA race and the 1967 CAMRA points title. 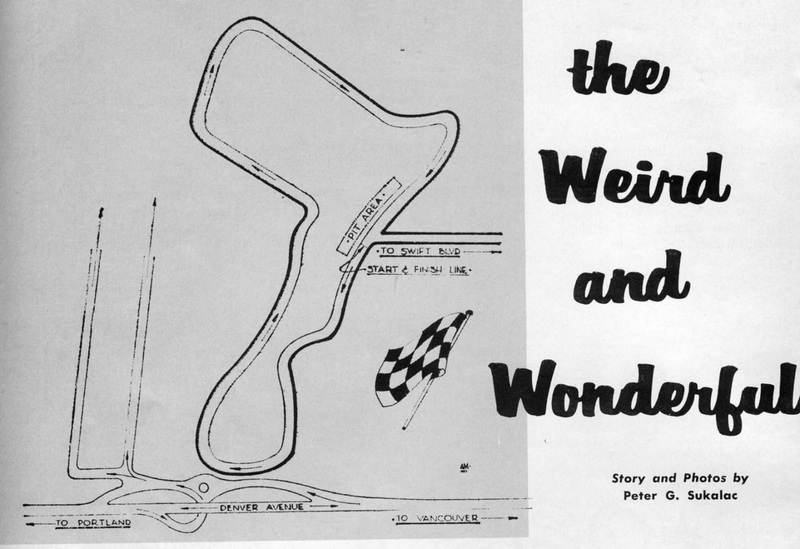 From 1940, the National Auto Racing News, which would become National Speed Sport News during the Second World War, had a short lived comic strip. "Race Track Hogan" might be a little corny but it has a racing theme. A ditty called "Mexican Road Race". 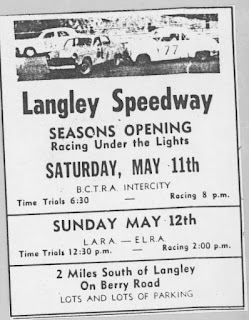 Has little to do with greater Vancouver racing except that Hershel McGriff, from Portland, a regular a Langley in the late 1960s into the 1970s, got his big break at that race when Big Bill France invited Hershel to the southeast to race on the NASCAR circuit. There is a story from Don Bennett, a Digney Speedway top gun, that there were plans to field a car in the early 1950s for the race. But those plans fell through, much to the relief of Don's mother. Plenty of reports and stories on the net about the Mexican Road Race. Last race of the season, the ELRA and LARA championship races. Again, just trophy dashes main events. Atchison started last, was first by lap 15. Jerry Janchak, from Skagit Speedway, hit the fence and totalled his car. 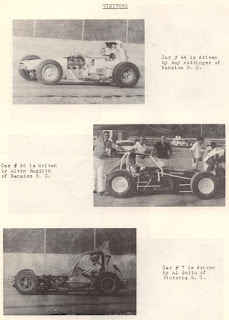 #118, John Bettles, voted most popular driver. Sandra Scott won a go-cart raffle from LARA. Trophy dashes and main events only. 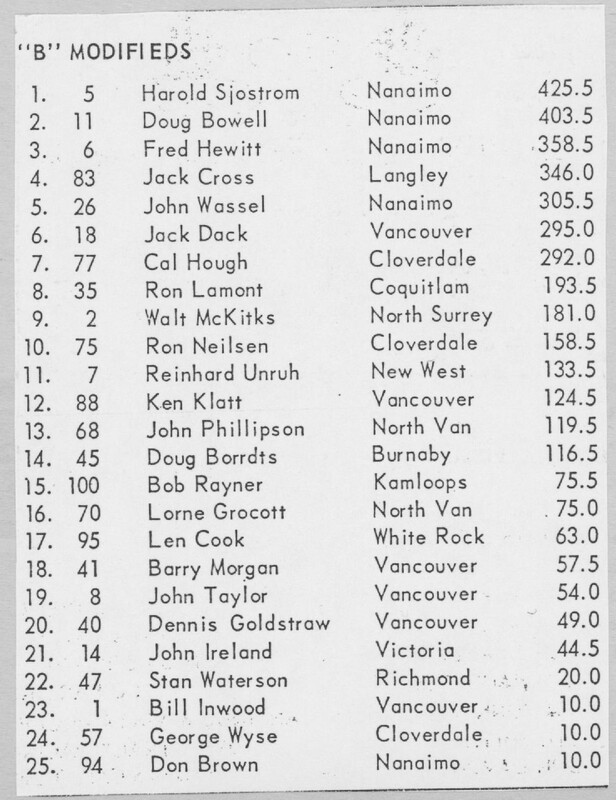 Longer mains as they were championship races. The CAMRA show got done with the usual satisfying results. 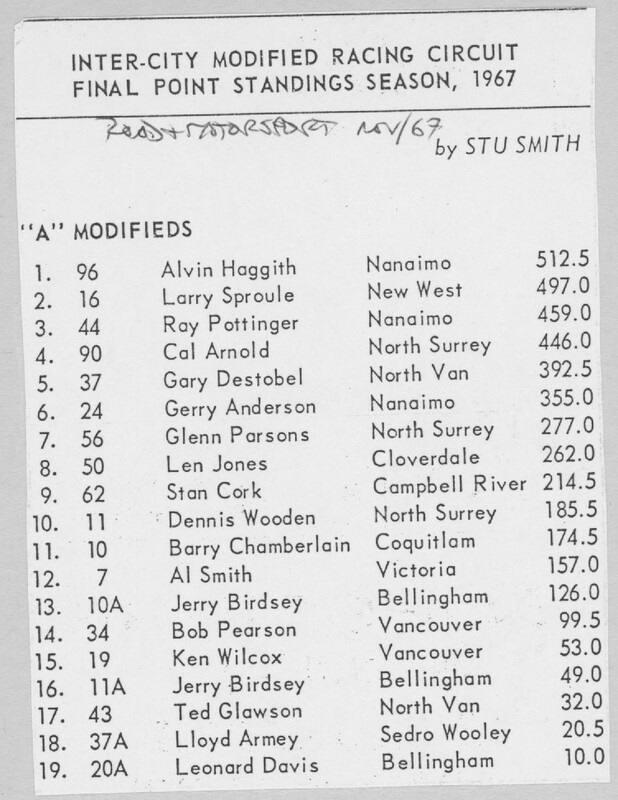 Local driver Larry Sproule showed well against the import drivers that came from Edmonton, Calgary, Spokane, and Victoria amongst other places. 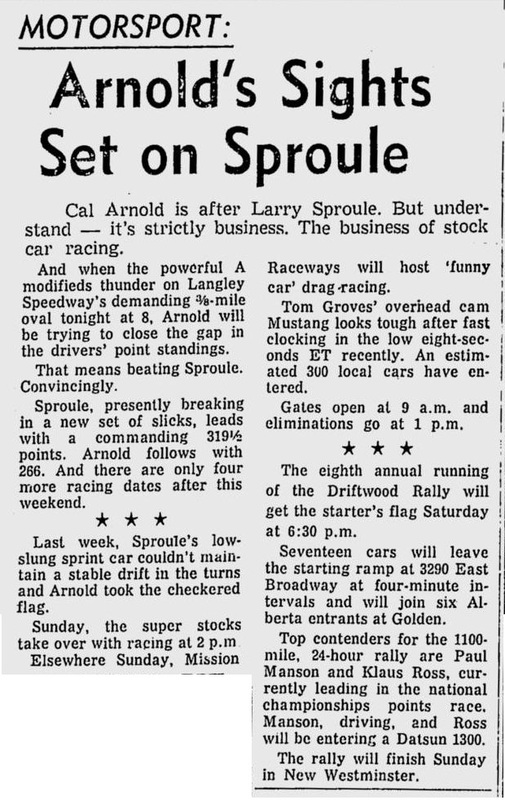 Sproule was ahead by a nose but the finish was recorded at the front wheel. Crashes on laps 2, 3 and 19. 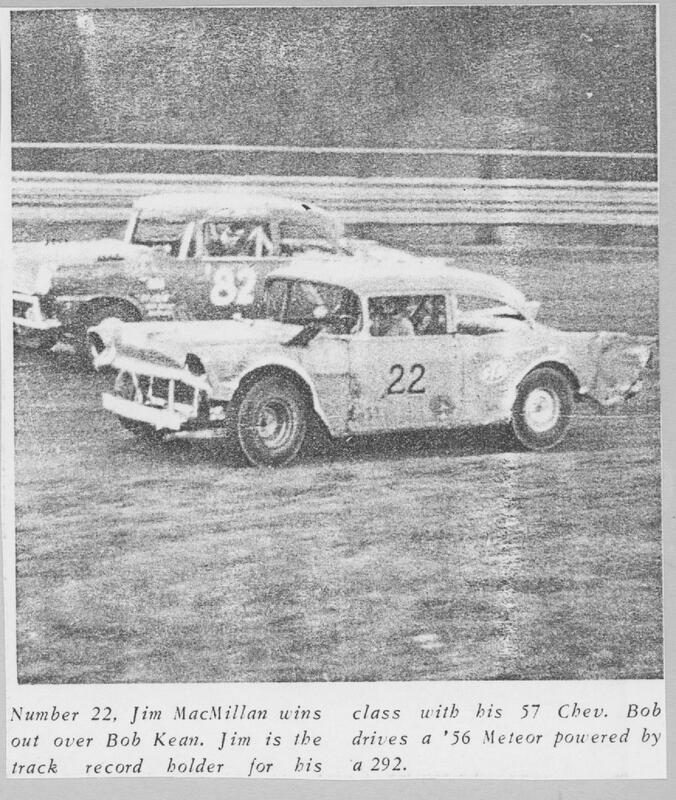 Lap 35 -- Bud Gorder blew an engine and the oil took out Gary Destobel, Bob Gregg and Barry Chamberlain. 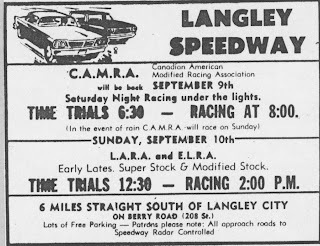 The Canadian American Modified Racing Association was scheduled for its third appearance at Langley on Friday, September 1, 1967. Unfortunately it rained. 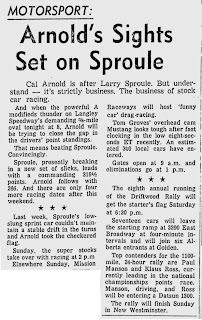 But, fortunately for racing fans, it was rescheduled for eight days later. 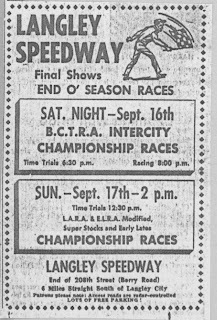 LARA and ELRA got their show in on Sunday afternoon, September 3, 1967. Visitors from the south augment the afternoon of racing. 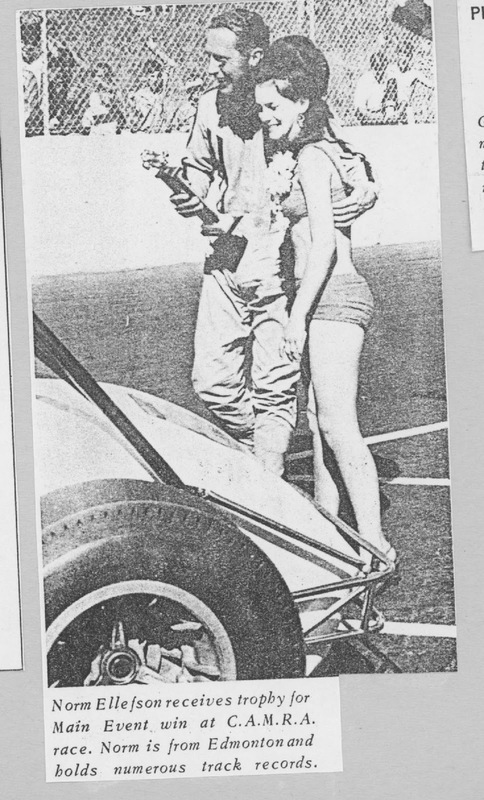 A couple from a Spokane newspaper. Hopefully not repeats. 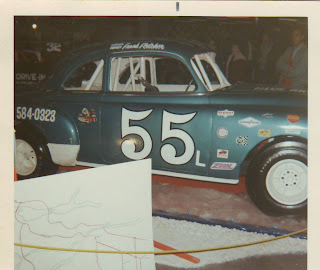 From the Ken McCauley collection. His name is showing up in the results for 1967. Brian Thompson is in the number 4 Hudson Hornet. Another Saturday evening at Langley. 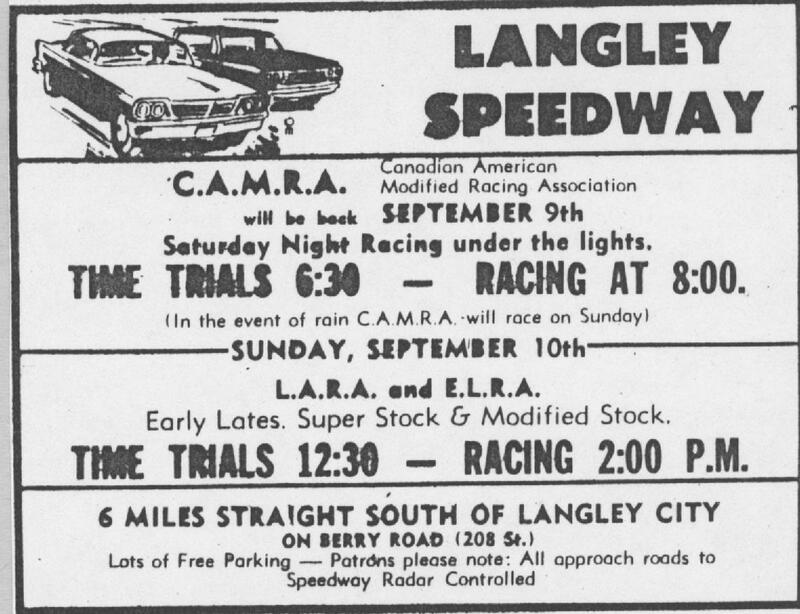 Two Nanaimo drivers who did well at Langley. 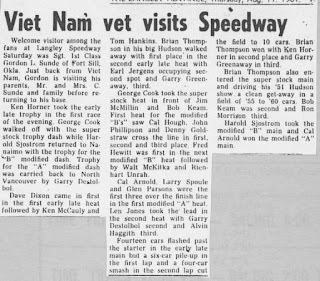 Ken McCauley rolled in time trials but came back to race later. 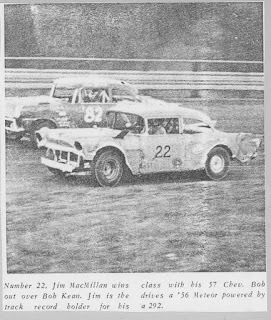 Jerry Birdsey broke an axle on lap 14. 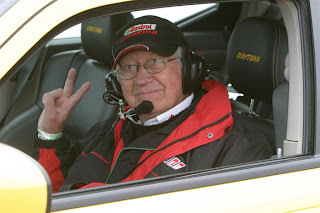 Ron Curties, long time member of the Sports Car Club of B.C., amongst other distinguished affiliations, has passed away. 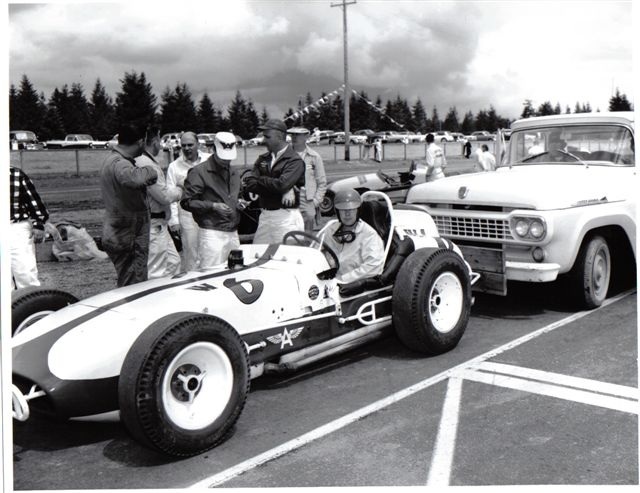 He was a 2009 inductee to the Greater Vancouver Motorsports Pioneers Society. 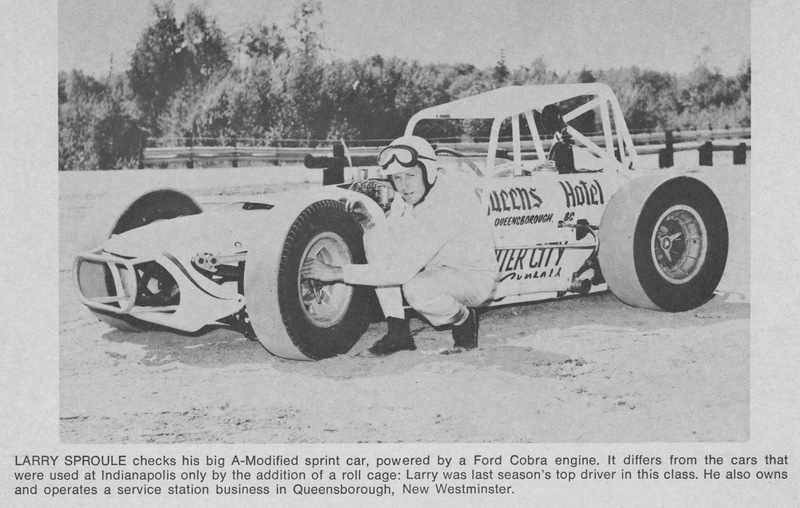 His racing days went back to the 1950s at Abbotsford Airport. Not a very good photo but that is Ron Curties flagging a sports car race at Abbotsford in the 1950s. At least there's a Lee Kelly report from to Racing Wheels to help with everything. Not much information on this, but it was reflected upon by Mike McCardell on Global news this evening. Whistling Bernie Smith has passed away. He was in his late 80s. 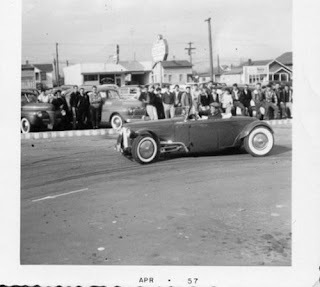 A long time Vancouver policeman he helped get the hot rodders off the street and onto the drag strip. 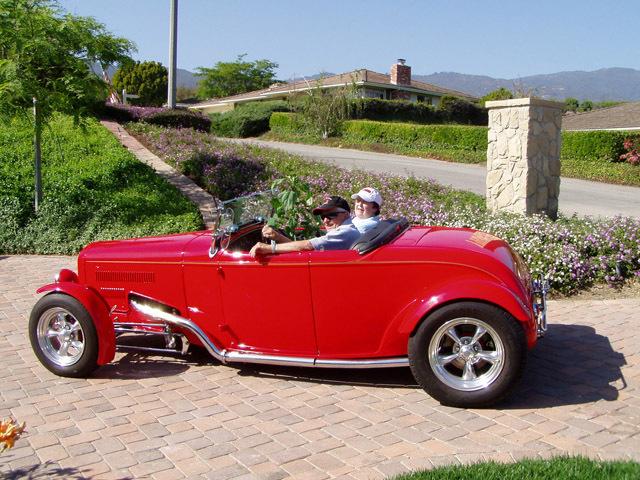 He was recognized by the Greater Vancouver Motorsport Pioneers Society in 2004. Frank Fletcher's early-late. 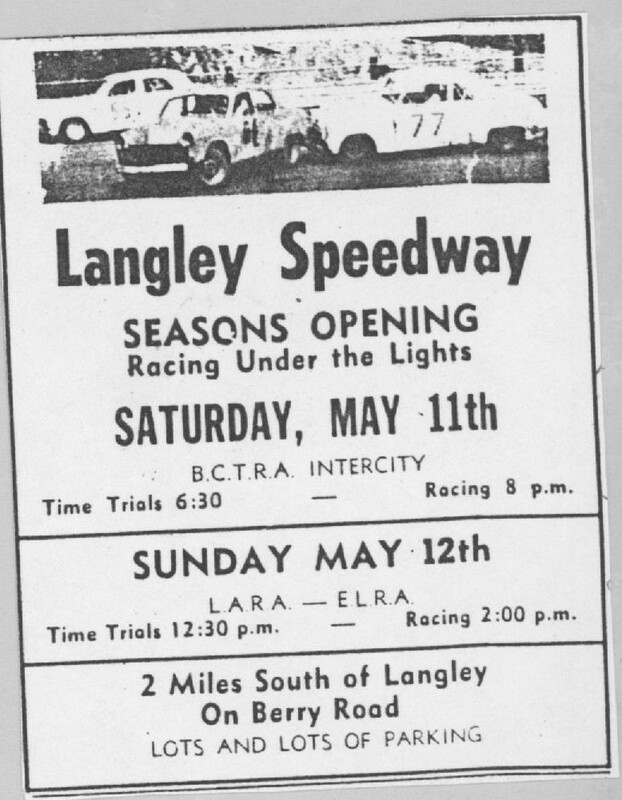 From the Langley Speedway Historical Society archives. Bert Delisle flipped lap 4. WHICH IS 1 MILE FROM B.C. FERRIES TERMINAL AT SWARTZ BAY. -The directions to the marina / yacht club are - off the ferry and down the hiway ( right lane) about 1/4 mile, take Off ramp ( McDonald Park Road) to the top , turn left and go across the hiway overpass, take first left down to McDonald Park Road (T). Turn right and go about 3 blocks , then left on Blue Heron Road. Marina is about 500 yards down on left. Return to the ferry down McDonald Park Road and merge on to the hiway to the ferry terminal. 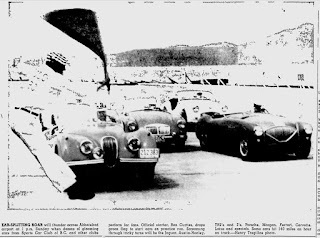 Interesting film clip of Stirling Moss and Phil Gaglardi (Minister of Highways back then) doing some promotional work at Westwood. Sir Stirling in the Bob McLean Lotus and "Flyin'" Phil looks to be in G.B. Sterne's Morgan. I think I should get back to the results. No, not election results. Racing results. 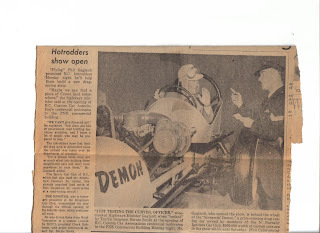 I realize now that I stopped because the next day (August 13, 1967) I haven't managed to get back to the library to get a page from the newspaper scanned so I can have complete results. 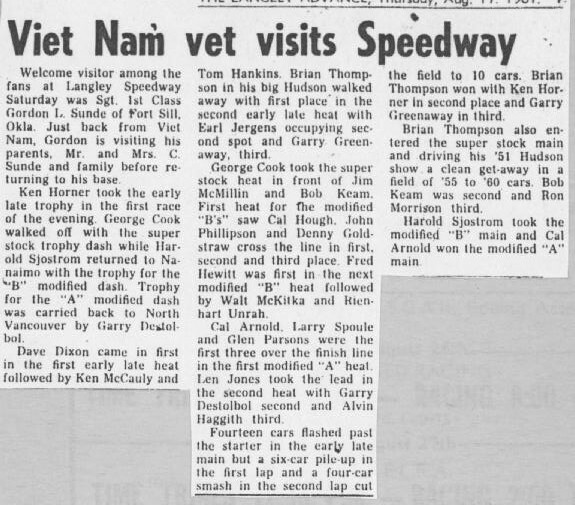 Also ran: George Cook and Jim McMillan crashed. Racer and broadcaster, amongst other things, Craig Hill passed away a few days ago. Here is a link to some thoughts on Craig. Best known for his hot rod The Apache, Jim McGowan has passed away. Gary Coe, up from Portland, always got everyone's attention. As did Bob Kokotailo in his wheel standing Henry J. And Gary Beck was building toward a hall of fame career up in Edmonton. Always a winner at Mission. NHRA Division 6 hall of famer. Buck Kinney. A couple one panel cartoons. 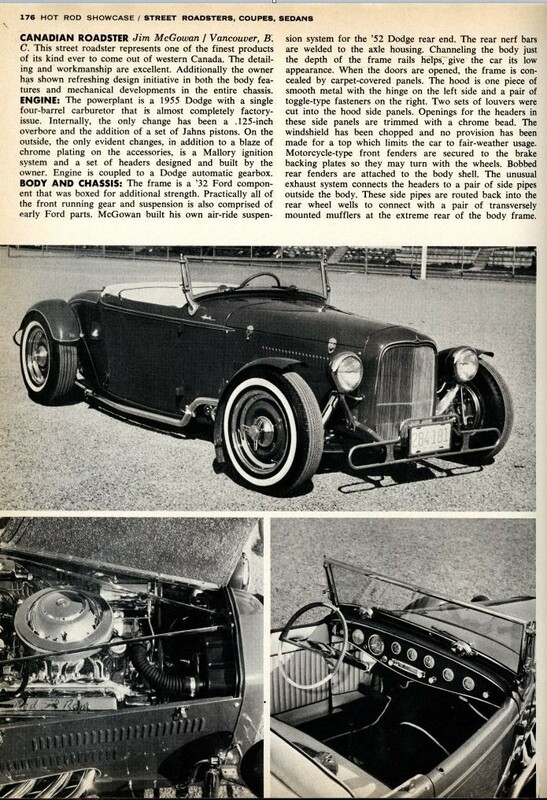 A couple more photos from the 1970 Wheelspins that I've been able to scan. Again, from Mission.